Wells Fargo carried much of the gold, silver and money of the West. This treasure often attracted outlaws. Between 1870 and 1884 bandits attempted to rob Wells Fargo gold shipments 347 times. The infamous "Black Bart" robbed 27 stagecoaches before he was apprehended. The Wells Fargo Company hired men like Morgan & Wyatt Earp to guard the valuable shipments. 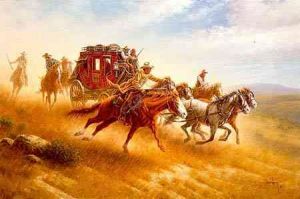 The five "shotgun riders" in this painting are on a mission of protection as the gold-laden stagecoach stampedes toward the safety of San Francisco.